I do not sell or repair this product. I borrowed this from Bosch to road test. Or, to try and break it, so to speak. 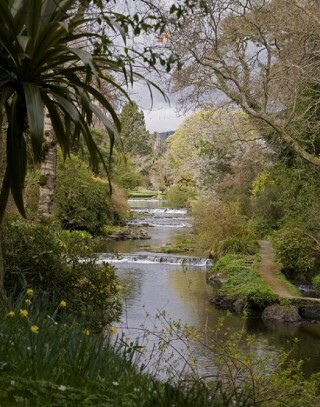 Peter Donegan very happily makes fine gardens for a living. No better man to put something like this to test. Full review, video and images below. 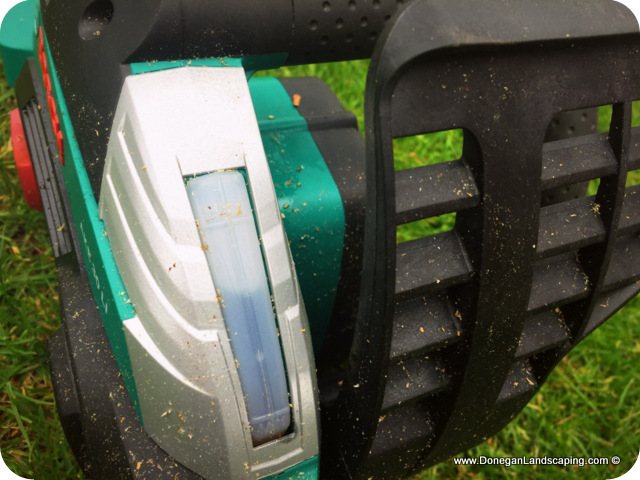 I was testing this in my own back garden; and under normal circumstances I’d have worn all of the proper chainsaw safety gear – which I totally recommend you do. That said it literally arrived by courier, I phoned my mate Phil and we decided to give it good once over there and then. This is not a Bosch video. It is a Peter Donegan video, made on an iphone, in my own back garden. 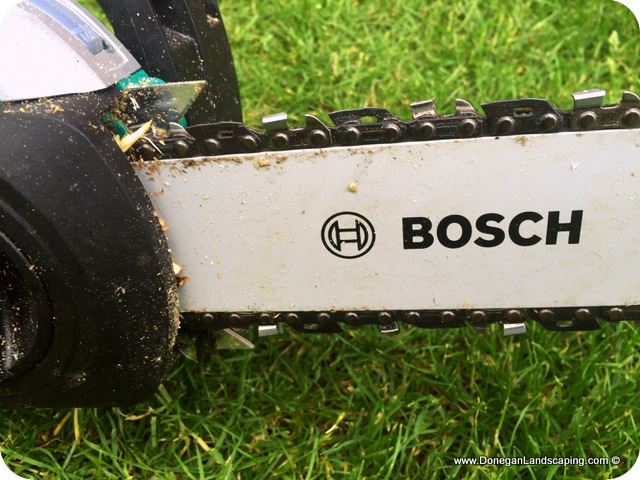 As previously noted, I had heard about the Bosch AXT 25TC from my mate and neighbour Phil. I met the Bosch team at Bloom where we recorded a yet to air Sodshow interview. I later paid for and purchased the AXT 25TC. Weeks later I had a sort of “ye know what I’d love to get my hands on…” type chat with Phil. 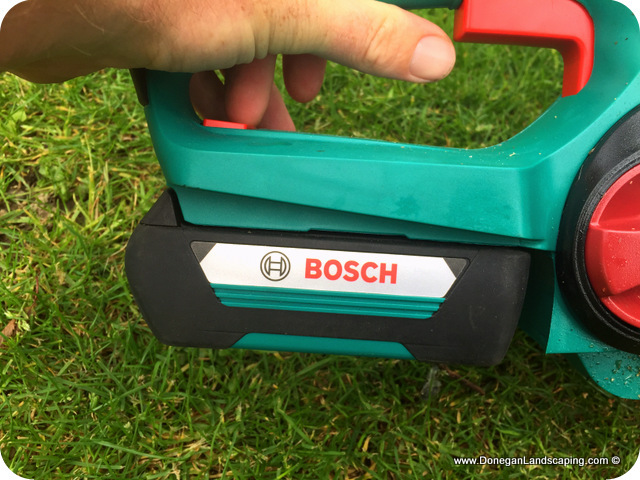 I asked the lads at Bosch could we road test some other stuff, and they obliged. As noted above, I do not sell chainsaws for a living. Peter Donegan and since 2001, Donegan Landscaping is an award-winning landscape design and garden making practice. Back to it…. 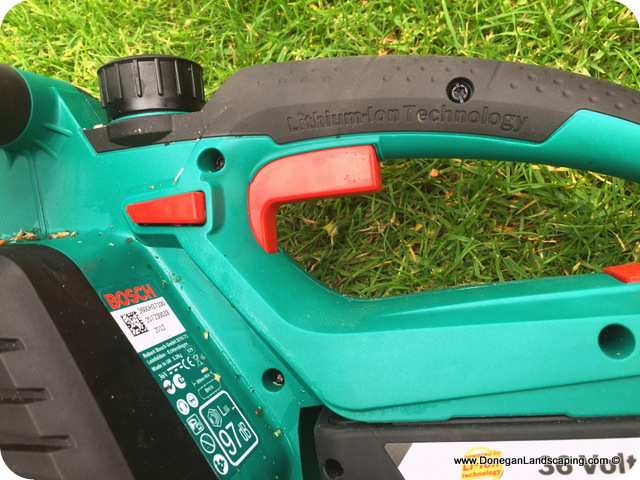 It does not take a two-stroke/ petrol mix, as conventional chainsaws would nor does it does not require an extension lead as usual electric chainsaws would. It does however need chain oil. I never bothered reading the instructions and pieced this together in around 2/ 3 minutes. It’ll take longer to recharge the 36v battery of which I should note the ‘how much it has already been recharged’ indicator is, watched kettles boiling department in mind, a pretty nifty addition. As is the chain oil level indicator visible on the outer. Further…. In adjusting the chain, you do not need a socket. Very handy for when you’re up a tree. It is around the same size as a small surgeons saw, pretty lightweight and actually quite a smart piece of kit. I like the fact that you just push the button and it starts – which sort of reminds of the first time I saw a BMW started by pushing a button; as versus by key turn. 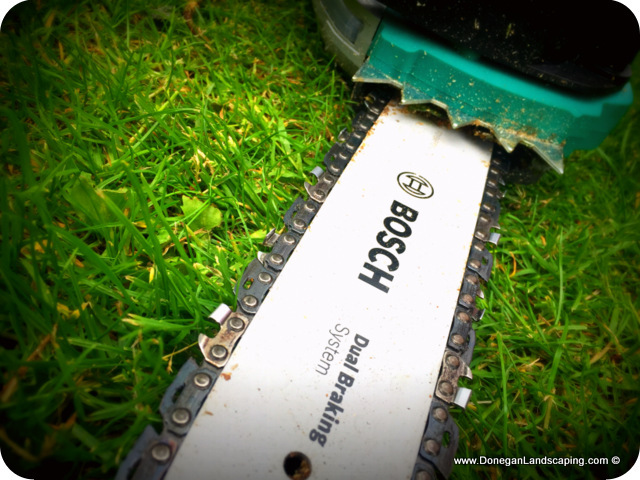 Or in tree cutting terms – no goofing around with a choke start. Kind of, hard to get my head ’round that still. Take a deep breath – SSP €599.99 (inc vat) with battery and charger. The video shows what it can do much better but, we really did try to test this to the max and ran it for about an hour thinning out a fairly scraggy boundary hedgerow. In fairness to it, it was well able to take all that we threw at it. Fair to say I was very pleasantly surprised. 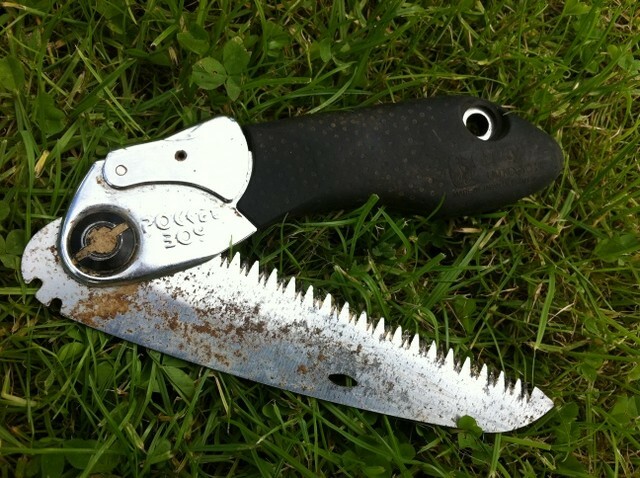 The usual thing that happens in conventional chainsaws is that some forget [?] 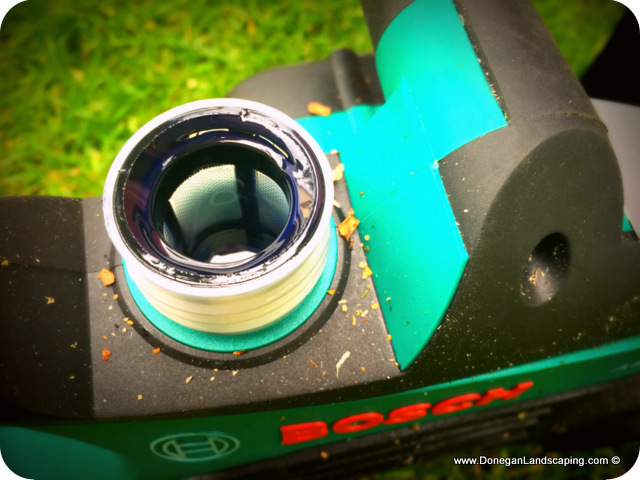 to put in the 2 stroke mix and just add straight petrol – which irrespective of cost and age will destroy any decent saw/ investment. Add to that the last saw I looked at of around the same size was around the euro 550 price range. 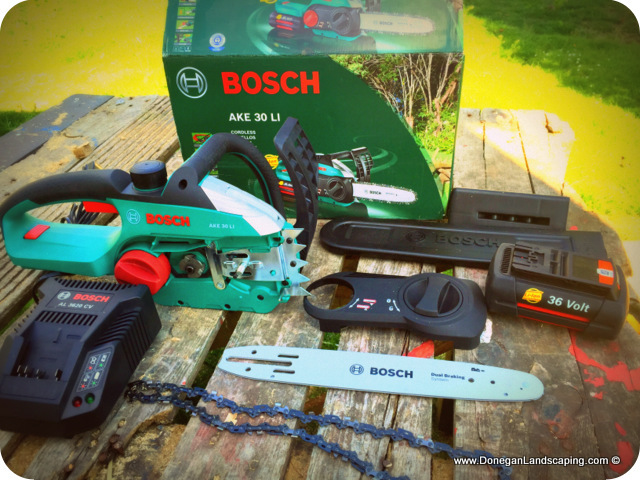 In a case where I don’t take down trees every day for a living (I design and build gardens) but owning a chainsaw is still an essential, then I guess yes is the answer, professional landscaping and my own garden in mind. Further…. 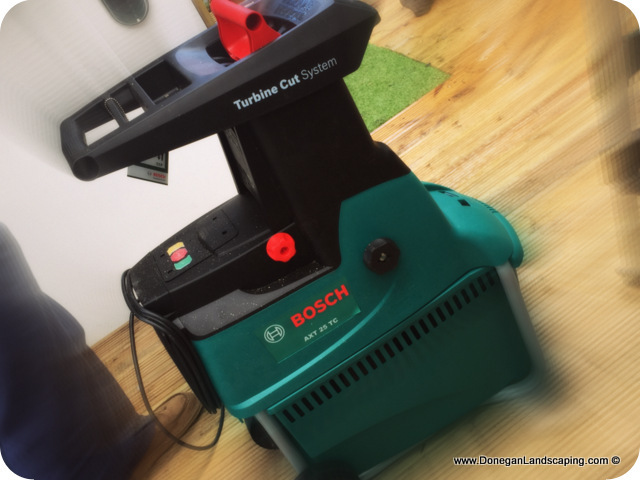 It is well able to compete with its counterparts of the commercial market and If you own a wood stove burner and/ or a garden like I do of about an acre, where a) hedgerows need to be managed b) trees require thinning/ pruning/ removal c) logging is essential for winter fuel – then you’ll probably like this little beauty, a lot. 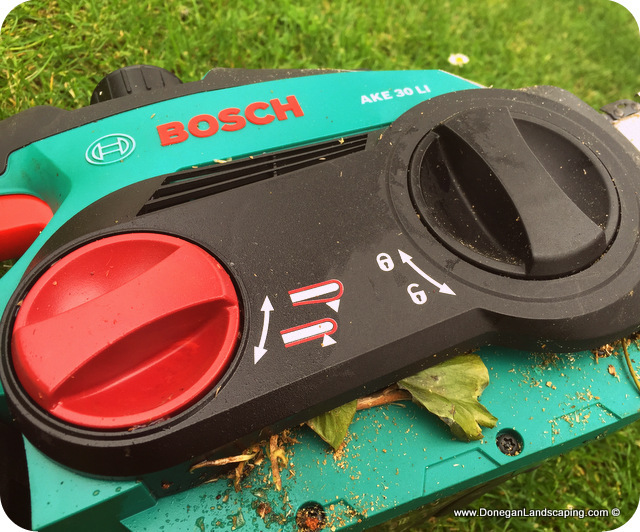 Having only ever used two stroke conventional versions all of my life, it is tough for even this petrol head to type it, but having got my hands on it The Bosch AKE 30Li I can only but recommend it as a genius piece of kit for both domestic and commercial use. I did pay for this product. As we head past the August mark on the calender towards what I would note as the wetter and latter months of the year, some may be noting this as their time to hang up the outdoor paraphernalia for what may be considered the off season. Not on your nelly says this fellow. To me, the more inclement the weather the more interesting I say. Whether it be Electric Picnic were it always rains on the final night, a walk in Donegal were all for seasons are guaranteed within the space of one weekend two hours or like me you just like camping and working outdoors in all seasons – the following are five essential products that make my great outdoors experience greater. First up it’s all about keeping the upper body warm and dry. This is in short no ordinary t-shirt and if you think I might model this for the sake of a blog post, you are [happily/ sadly/ delete as appropriate] mistaken. 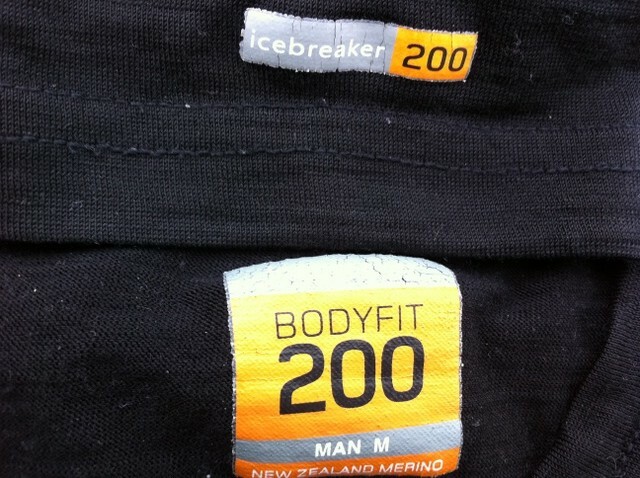 That said, the Icebreaker bodyfit 200 holds tight to the body and warms me almost immediately. I own three of them now and they are the ultimate piece of clothing for this gardener/ festival/ outdoors trekker. 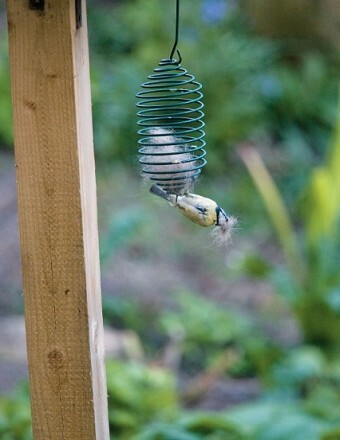 Wind resistant. Highly breathable so moisture vapour escapes. Liquid moisture is pulled away from the skin and released as moisture vapour. warm air is trapped between layers. Warmth is trapped in air pockets between each layer. I say: it is a genius piece of clothing. Extremely light. Dries out very quick and is essential if you are to be outside from September onwards in Ireland. I bought the long sleeved version. Black in colour to soak in any available Irish sun that little bit quicker. Also: check out their BAA code tracker. Second is about keeping the rest of your clothes and food dry and as important comfortable to carry. There’s confidence for you. 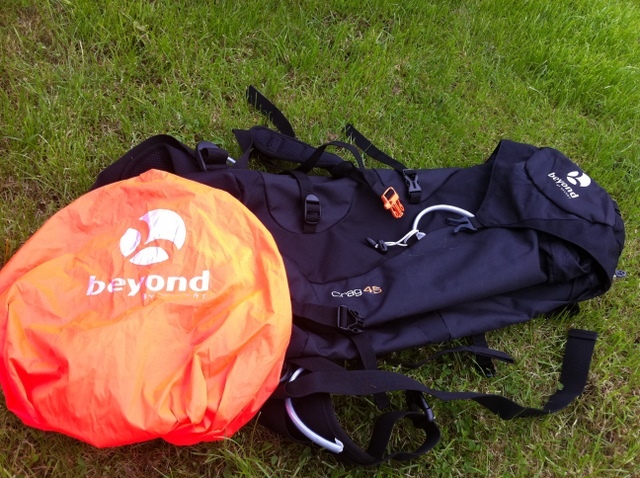 45 litres in size it has enough adjustment straps to suit perfect to your shape and an air fit system to suit your back in comfort whilst drying sweat away. Better again it is water safe but has what I can only describe as a mini-parachute tucked into its bottom that can be taken out and pulled over for extra water-proofing. So suited to the great outdoors the chest straps come with a built in whistle, that works. This one costs €44.99. No. 3 is the light that guides you. About the only thing on the list that may not be used by me as a gardener yet I still keep it in my jeeps glove compartment. 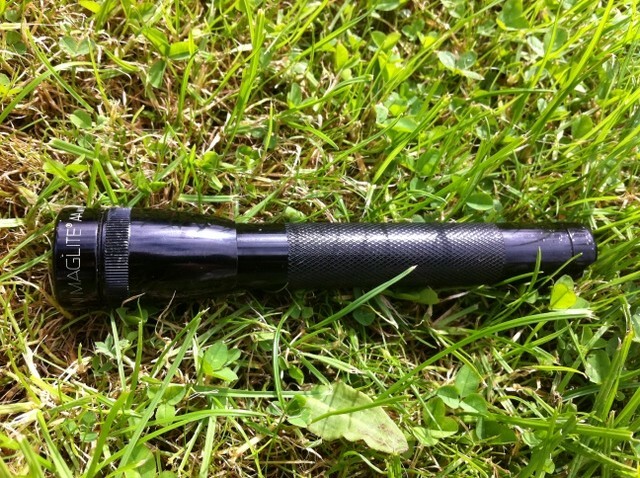 I have this maglite torch years. Pretty unbreakable, durable and just ruddy well made, it is so much so I have never replaced the bulb on it. In search of an official note that says how waterproof it is and also the light strength – the Maglite official website is pretty brutal – and I couldn’t, officially find an answer. That said mine has fallen in river, lakes, puddles and last year spent three weeks outside in the Irish snow and still, the old horse works like a charm. More than that I consider it a valuable and at a little wider than a pen, it fits perfect on my person and is well able to take on the big boys in the how bright can you shine contests. No. 4 is for fire wood and furniture. I say: I’ve had this one about eight years now. 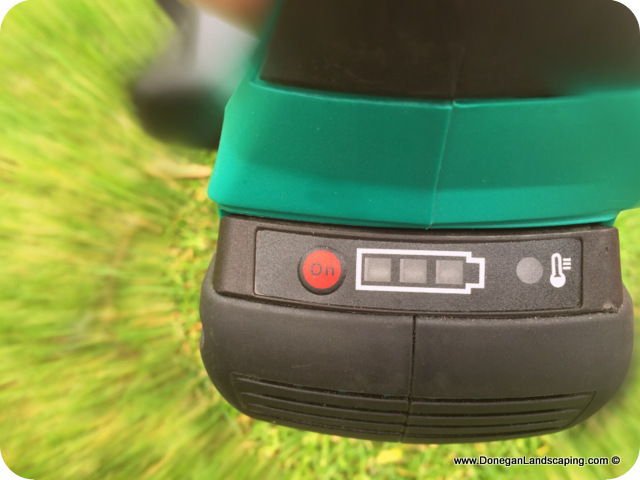 Light as a feather and once again takes up very little space, this is a genius little product and an essential for this gardener, camper and great outdoors lover. Another great investment. Finally it is all about keeping the head dry and warm. 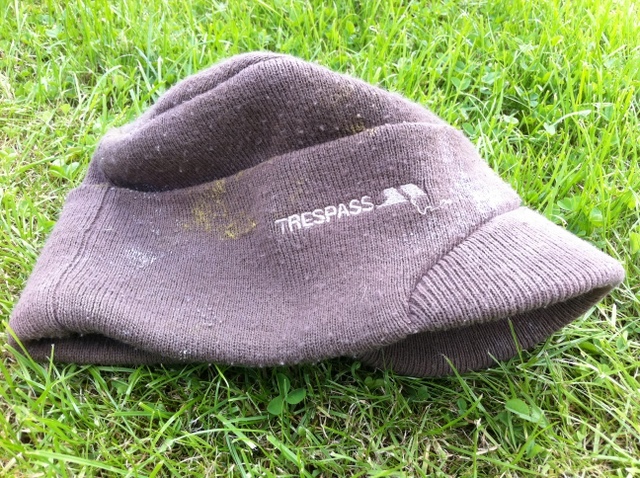 As you can see this Trespass Commanche hat has been with me for some time. Peaked at the front and without even pulling the flaps down I have done very little by way of gardening, camping or trekking without this in my arsenal. This has more often ended up saturated on the outer whilst I’m bone dry by way of hair style inside. I couldn’t find anything about it on the Trespass website – that’ll possibly tell you how long I have it. 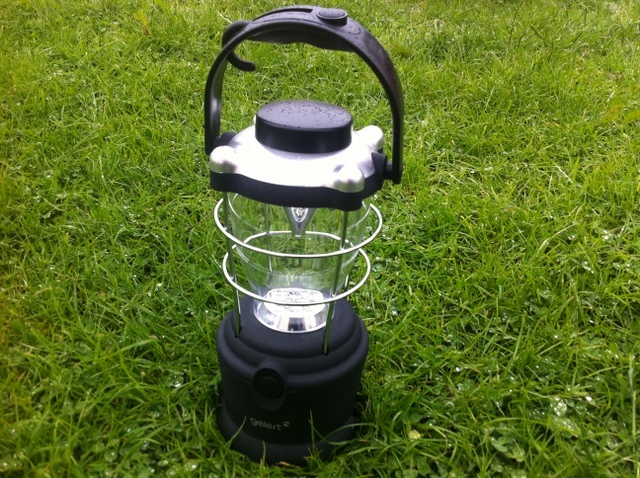 This is the Gelert wind up lamp. I bought it in Millets camping shop in Mary Street. Not costing over €20, that I remember [I’m open to correction on this…. I lost the receipt so couldn’t double check], it is a pretty genius piece of what I now call one of my camping essentials. I have another LED type light that I’ll review later but, this wins top marks for a few reasons. I love the two light level settings. Really important when camping and considering others inside and outside of your tent. More than that it’s light enough that doesn’t wake a one year old by being too bright. The big reason I like it so much, is the fact that one always forgets the batteries or leaves the light on overnight. In this case it doesn’t matter. I also left this outside over night in the rain for the craic, something that always happens with torches. It was grand the next day. It’s also quite durable and light wieght. For this Irish camper it scores 10/ 10. This is the lamp demo during the day. Recorded July 4th. This is the lamp at night time. Recorded June 12th. And to my review of Jane’s book…. Before I begin my review of The Living Garden, I must admit that I know Jane Powers. Who doesn’t, this is after all Ireland you say and Jane has been writing gardens for The Irish Times since ’97. 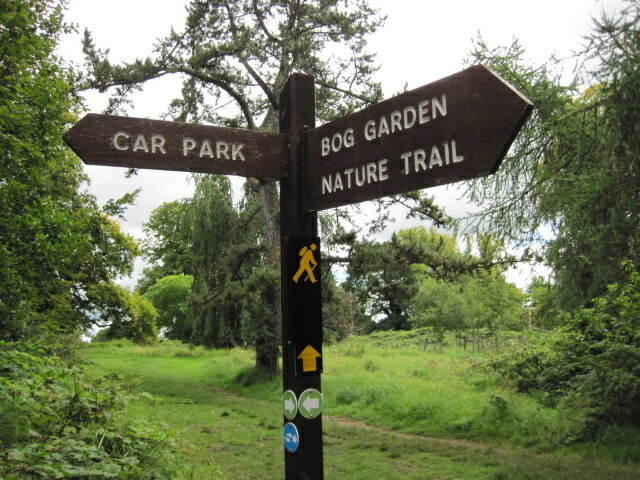 As to my knowing her better, Jane is a regular guest and contributor on the SodShow, the garden radio programme I present. 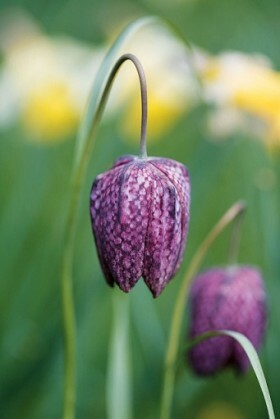 It has been a long time since I reviewed any garden books. Like ’80’s music I got quite bored. A bit of the same old same old, you might say. But this review is not the place for more detail on that, although, it does pose relevance to the reason I like this book, a lot. The first thing I noticed throughout Jane’s writing is that she refers constantly as I, the singular, her, the individual – the gardener of her own garden. And it is from there that I get a better insight into what, how and why Jane gardens as she does. I can disagree with her as I read. Or agree. With her. I have done both before and will most likely do again. My point is that this is not a cook book. It is not a series of menu’s. And neither is gardening. 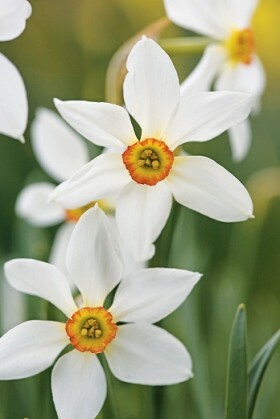 This is Janes way of gardening as she does it, for real and it is written and explained in that manner. 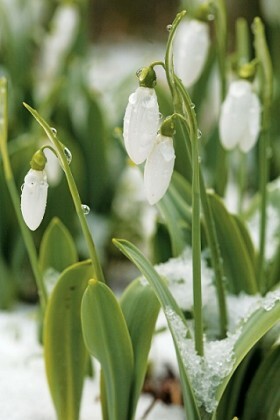 All the photographs I sent through were in fact taken by Jane Powers herself, and are © Jane Powers 2011. Let me know if you need any further info. Now we’re on the same wavelength. 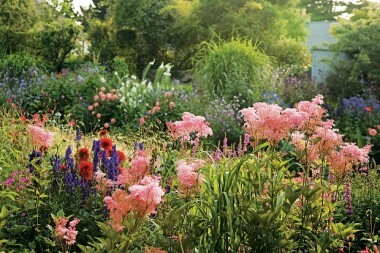 You see I know Janes garden. 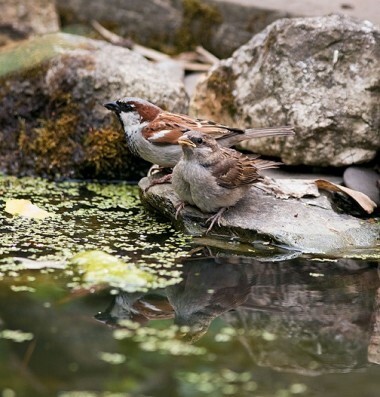 I also know after 4 years writing this blog you can’t set up nature for a great photo shoot. Sometimes you were just there. And Jane as versus any other photographer was. Greater than that, it backs up what is in text format. I love the oddball yet relevant and logic elements of the book. 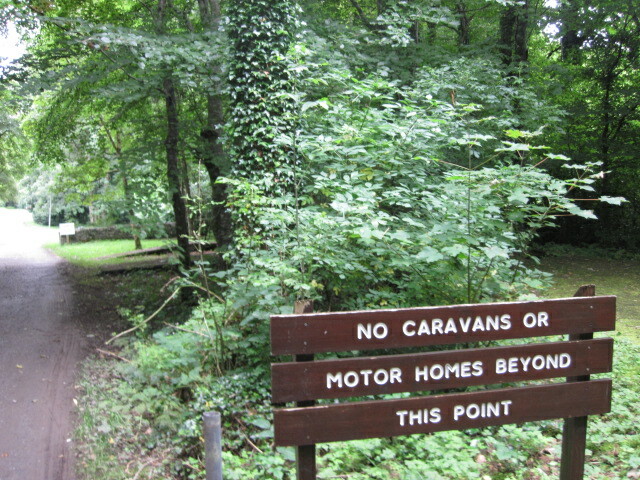 Jane’s plea to save the clothes line, a note on avoiding the Leyland Cypress, a crash course in thinking about vegetables. 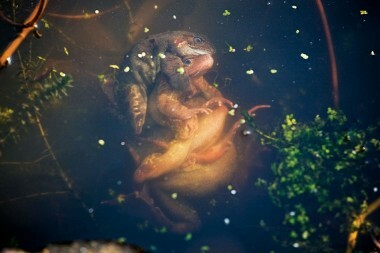 There’s a title called things that slither in the night – slugs and the like – it comes with a sub plot called strategies. It speaks logically about hens, about them getting on in life and gets you, to think for yourself, before, during and whilst you garden. It doesn’t assume I and you have a degree in horticulture. Not to sound so grand, but I have studied horticulture. I have plant dictionaries, albeit very useful to me they are the worlds most boring books. Similarly, I have always analogised explaining gardening with being thought poetry in school. One can tell me what the poet is thinking, the theory and theme of the poem. Or one can read me poetry, allow me to enjoy or not the tune being read and allow me to think for myself. Rather than being able to recite, I want to first understand. We may all be gardeners. But we will never know it all. 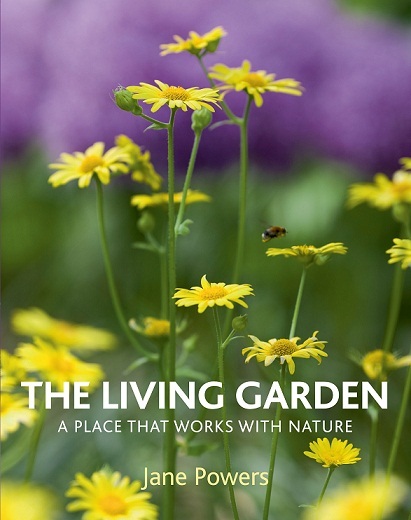 Potential or expert, Balcony or Estate, The Living Garden – is – a bible for those who may wish to begin gardening and a problem solving, idea generating, creative mind stirring directory for those who have a garden. More than that it is a genius piece of reading for those who, like me, enjoy gardening. 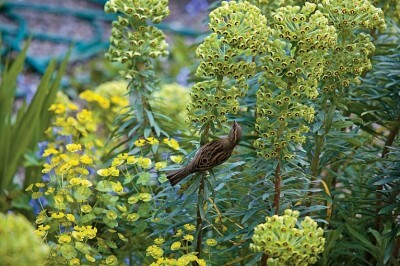 In The Living Garden Jane Powers writes entertainingly and expertly on how we can manage our plots – big or small – in a way that is both welcoming to wildlife and good for the rest of the planet. 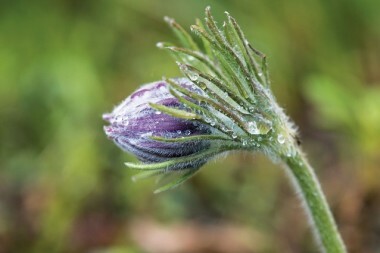 By cutting out harmful chemicals and using the right plants for our climate and conditions, we can make a garden that has a life of its own, in which flora and fauna are intricately interwoven. 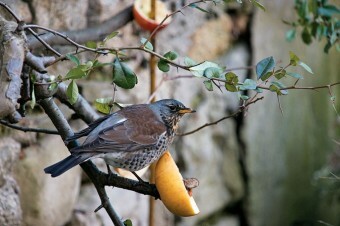 Jane describes, in her lyrical but commonsense writing, how to plan and plant for birds, bees and other creatures (including humans); and how to grow our own food, look after our soil, make compost and plant potions, sow and save seeds, propagate plants and carry out other essential tasks. She is in favour of sustainable, eco-friendly methods, but is realistic about her limitations. The book is priced at £25. I don’t know what that is in Ireland/ euros. And is all good book stores now.